A SECURITY call to Action…around a Wedding theme! Is ‘Intellectual Security’ in Your Vocabulary? Qualify the Culture - "Transformation Changes Sales Cycles"
“Bagging the Video Giant” Schneider Electric Purchases Pelco! A New Market Opportunity: Are You Moving Forward? ISC West: "Simplify the Best"
ISC West: Is Security Convergence a Crisis or an Opportunity? The Security Industry is in “Operational Transformation” Mode: Are You? From the Industry Guru's Lips to Your Ears: "Convergence is Real"
Attention Physical Security Industry: 2006 Was Your WAKE UP Call! "Mr. Convergence" Understands Surveillance Storage Infrastructure, Do You? Do You Understand the ABC's of the OSI Model? 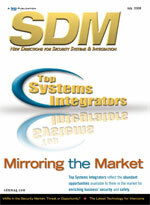 Security Integration: New IT Partners in 2006? Please return to this page as we will be updating the content for new publications.